Nehemiah 3:1-5 1Then Eliashib the high priest rose up with his brethren the priests and built the Sheep Gate; they consecrated it and hung its doors. They built as far as the Tower of the Hundred, and consecrated it, then as far as the Tower of Hananel. 2Next to Eliashib the men of Jericho built. And next to them Zaccur the son of Imri built. 3Also the sons of Hassenaah built the Fish Gate; they laid its beams and hung its doors with its bolts and bars. 4And next to them Meremoth the son of Urijah, the son of Koz, made repairs. Next to them Meshullam the son of Berechiah, the son of Meshezabel, made repairs. Next to them Zadok the son of Baana made repairs. 5Next to them the Tekoites made repairs; but their nobles did not put their shoulders to the work of their Lord. 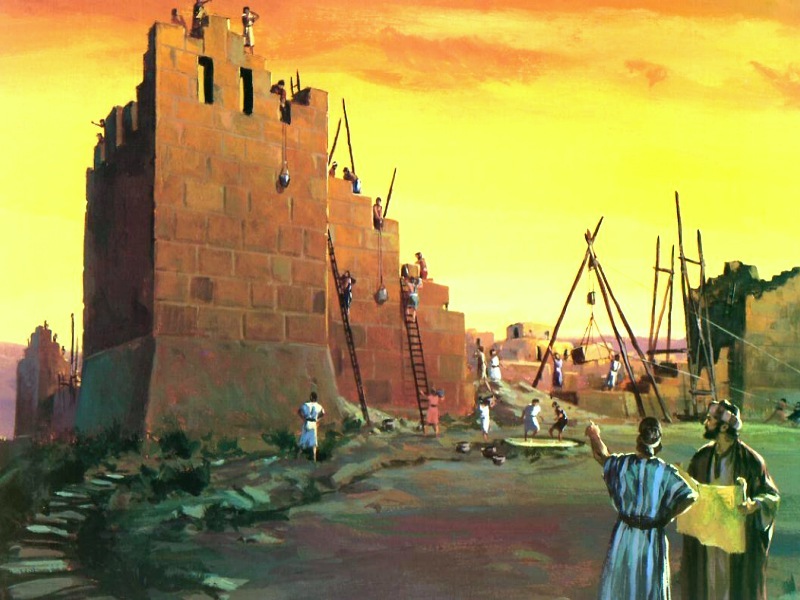 Overall Background: By now you should be familiar with the story of Nehemiah. God laid on his heart to leave his high position in Persia and go help the people in Jerusalem. Why? They were under great distress and reproach because the wall was broken down and the gates were burned with fire. So Nehemiah leaves behind his life of luxury and power and prestige and comes to Jerusalem and challenges the people to rebuild the walls. They actually listen to him and begin the work but not everybody is happy. Three men – Sanballat, Tobiah, and Geshem come against him. They laugh at him; they scorn him; they question his motives; and they even try to threaten him. How discouraging is that! There is a lesson here for all of us—anytime you do anything that is worth doing, there will be opposition. If it were easy, everybody would be doing it! For e.g. I was on the campus of Liberty University this weekend, reading an important paper in front of scholars and teachers. I had a little time to look around at the campus. Wow! One man felt that God had called him to do that and he did it with God’s help. Jerry Falwell used to say, “You do not determine a man’s greatness by his talent or wealth, as the world does, but rather by what it takes to discourage him.” This morning don’t let anything or anyone discourage you from what God has called you to do. Trust Him and look to Him. He is in control of your life. So in spite of the opposition, the people began to work with a new sense of purpose and joy. Application: It is so awesome when the people of God come alive. It is so amazing to see a church living with a new sense of purpose and joy. It brings glory to God; it brings life to the people; and it gets the attention of the world. At first glance Nehemiah 3 looks like an old roster—38 individual workers and 42 different groups, with names hard to pronounce. It was very tempting for me to skip over this chapter and go on. But there is a purpose for this list. The Holy Spirit put this list here for a reason. When you look at it carefully it is a wonderful model of how God’s people should work together. This morning as we look at Nehemiah 3, four words come to mind. But that’s not the priority that I am talking about. What did Eliashib the high priest stand up to do? To go sit on the high priest’s throne. No. He “rose up with his brethren the priests and built the Sheep Gate;” Why the Sheep Gate? There was the Fish Gate – they could have started there and helped improve the food market of Jerusalem; there was the Valley Gate – they could have started there and helped fortify the defenses of Jerusalem; there was the Water Gate – they could have started there and helped the water supply of the city. Instead, they began with the Sheep Gate. Why? It was in the northeastern corner of the city wall and it got its name from the sheep that were brought through them for the sacrifice at the temple. There were many gates that lead to the temple but it’s the gate that brought in the sacrifice that was the first to be built. Then “they consecrated it and hung its doors.” These priests knew what they were doing. They were doing the first thing first. People come to church for many reasons—family, friends, tradition. The main reason for the church to exist is the sacrifice of Jesus Christ – the Lamb of God who was slain from the foundation of the world. If anything other than the cross gets in the way, the walls of the church will fall. Our purpose at Clearview is to lead all people into a life-changing, ever-growing relationship with Jesus Christ. Application: Maybe you are here and you are lost. Coming to church will not save you. Giving to the church will not save you. Joining the church will not save you. Receiving His sacrifice on the cross will. You will have to come by the sheep gate. These people had money. They could have easily hired some local laborers to do the work. They did it themselves. Meaning: They were not ashamed to do the work. It was not beneath them to roll up their sleeves and go to work next to the brick masons and the laborers. Application: Now don’t show up tomorrow morning to help with the construction. It doesn’t work like that anymore. The point is, when it comes to the ministries of this church, no job is too low for you. You may not be called to every ministry but please don’t look down at it. But do you remember reading verse 5 though – “Next to them the Tekoites made repairs; but their nobles did not put their shoulders to the work of their Lord.” The nobles were not the rich. They were the high class. The imagery there is agricultural. It is a picture of a “stiff-necked” ox refusing to be yoked. They were too proud to be yoked with other people. They were too proud to bend down and pick up a few bricks. Maybe Nehemiah did not ask their opinion. Maybe Nehemiah did not run everything by them. There is pride even in the church today. For e.g. How many people struggle with pride raise your hands? I am preaching to you today. But I am really preaching to all those who did not raise their hands. Pride is not having good self-worth or taking pride in a job well done or being proud of your children or grandchildren. But pride as mentioned here is the comparing of oneself to others and feeling good about ourselves. It is the source of all conflicts in the church. It is the source of all prayerlessness in the church. It is the reason revival tarries. 2 Chronicles 7:14 14if My people who are called by My name will humble themselves, and pray and seek My face, and turn from their wicked ways, then I will hear from heaven, and will forgive their sin and heal their land. Application: Pride is also the source of all marital and family and relational conflicts. Many people were helping but not for themselves. They were doing it for others. How do we know that? – Verse 2 Next to Eliashib the men of Jericho built. – Verse 10 Jedaiah the son of Harumaph made repairs in front of his house. – Verse 30 Meshullam the son of Berechiah made repairs in front of his dwelling. Some might say this is so male chauvinistic. – Verse 12 Shallum the son of Hallohesh, leader of half the district of Jerusalem; he and his daughters made repairs. A church that fails to train the young people to take their place has failed the Lord Jesus. Many churches do some of the craziest things to attract young people. Why? Because we failed to win them in. I believe that Jesus can come any moment. No prophecy has to be fulfilled. What if He doesn’t come for another 100 years? Have we done all we can to pass on our faith to the next generation. Think about those early Christians from the area around the Middle East. They are looking down from heaven and seeing their children and grandchildren not worshipping the living God. Application: Are your children and grandchildren on fire for the Lord? This is the best part. There are two names that I want to look at real quick. – Verse 4 And next to them Meremoth the son of Urijah, the son of Koz, made repairs. Who was Meremoth? He had a bad past. His grandfather Hakkoz had been removed from the priesthood because of marriage after false gods. Meremoth could have been bitter, gone astray, and followed in his grandfather’s way but he got right with the Lord and there he is making repairs. What a testimony of the grace of God! Our past does not have to control us. – Verse 11 Malchijah the son of Harim and Hashub the son of Pahath-Moab repaired another section, as well as the Tower of the Ovens. Who was Malchijah? He too had a bad past but it was not his grandfather. It was him. 13 years earlier, he also had a married after false gods. Under Ezra’s ministry he got right and he is repairing. What a testimony! God works in mysterious ways. What the world needs to see is your testimony. It is no secret what God can do. What He’s done for others, he will do for you.